A complex system of self-governance, the main function of the nervous system is integration, achieved by controlling the fish organs and its connections with the outside environment. The nervous and the endocrine systems are interdependent, but often act jointly. They both transmit signals to effector organs, those transmitted by the nervous system are of electric nature and travel fast, while signals transmitted by the endocrine system travel slowly and are hormonal. Combined these signals regulate a range of functions that depend on environmental stimuli and a set of feedback mechanisms. The nervous system is divided into two parts, the cerebrospinal system comprising brain, spinal cord, ganglia and cranial and spinal nerves; and the autonomous or vegetative system, formed by ganglia, sympathetic and parasympathetic nerves. The ganglia are located outside the spinal cord and the brain. They are clusters of neuron somas that act as centres of retransmission by means of synapses with preganglionic neurons. The nerves, which are the essential part of the peripheral nervous system, are formed of bundles of fibres surrounded by connective tissue. They transmit sensorial and motor information between tissues and organs and the brain and spinal cord. Fig.1: Skull opened showing the brain and spinal cord. The basic function of the brain and spinal cord is to coordinate sensorial stimuli with the responses of muscles and glands. They are housed in protective bony structures – the skull and the vertebral column respectively (Fig. 1), and surrounded by a system of two membranes called meninges, one internal (endomeninx) and other external (ectomeninx), separated by a thin layer of adipose tissue. The brain and spinal cord have internal spaces the ventricles and the ependymal tube- respectively, through which the cerebrospinal fluid circulates. This fluid is produced by four highly vascularized areas of the brain, called choroid plexuses. The function of the cerebrospinal fluid is to distribute nutrients and remove metabolites. The peripheral part is formed by ganglia, and the cranial and spinal nerves. The brain is the main centre of integration. It is divided into five regions, from cranial to caudal: telencephalon, diencephalon, mesencephalon, metencephalon and myelencephalon (Fig. 2). The telencephalon is comparatively smaller than in mammals, and is mainly formed by the olfactory lobes and bulbs and by the telencephalic lobes. Olfactory lobes and bulbs are joined by olfactory tracts of variable length according to species. Telencephalic lobes are cover dorsally by the anterior choroid plexus, and internally contain one ventricle. The main function of telencephalon is olfactory. It receives the cranial nerve I or olfactory nerve (sensory). The diencephalon consists of epithalamus, thalamus and hypothalamus, which are its roof, walls and floor; and contains a ventricle. There is a dorsal choroid plexus and a ventral choroid plexus, called saccus vasculosus, which cavity continues that of the ventricle. The hypophysis or pituitary gland, occurs in the hypothalamus [link to endocrine system] and the gland is divided into neurohypophysis and adenohypophysis. The posterior part of the epithalamus projects upward, forming the pineal gland or epiphysis, which is photosensitive in addition to its neuroendocrine function (see endocrine system). The main function of the diencephalon is to correlate incoming and outgoing messages related to inner homeostasis, through the hypophysis, which affects the endocrine system. It receives some fibres from the cranial nerve II or optic nerve (sensory) and also olfactory information from the telencephalon. The mesencephalon, which is the most conspicuous part of the brain when the roof of the cranium is lifted, is formed by the dorsal optic lobes and the ventral tegmentum. Its main function is integration of visual information and its coordination with the motor function and those of the other senses. It receives most of the fibres from the optic nerve, and gives rise to the cranial nerve III or common oculomotor nerve (motor). The ventricle of the diencephalon continues within the mesencephalon in a narrower duct, called aqueduct of Sylvius. The metencephalon consists of the cerebellum, which is the most highly variable structure in the brain and contains its own ventricle. It controls balance, swimming, muscle tone and orientation in space, by integrating the information from the lateral line with the information from the inner ear and the muscles. The cranial IV, pathetic or trochlear nerve (motor) arises from the metencephalon. The myelencephalon is formed mainly by the medulla oblongata, covered dorsally by the posterior choroid plexus. At the base of the medulla oblongata there are two large neurons, the Mauthner cells, whose axons run the full length of the spinal cord. These cells are motor coordinators for relaying multiple sensory impulses mainly from the lateral line centre towards the swimming musculature. They are related to rapid movements, known as Mauthner startle response, and are absent in benthic fish. The myelencephalon controls the ventilation rate and processes functions of the taste, tactile and lateral-acoustic systems. It is associated with the cranial nerve V or trigeminal nerve (mixed), VI or external oculomotor nerve (motor), VII or facial nerve (mixed), VIII or acoustic nerve (sensory), IX or glossopharyngeal nerve (mixed) and the X or vagus nerve (mixed). The spinal cord extends backward the length of the fish, from the medulla oblongata, inside the neural canal of the vertebral column. In highly evolved teleosts it ends in an endocrine gland, the urophysis. A cross section of the spinal cord shows a central zone of grey matter (predominance of neuron somas) in an inverted Y-shape completely surrounded by white matter (myelinated axons). The ependymal canal, lined with ependymal cells runs through the centre of the spinal cord. The free ends of the ependymal cells are ciliate and regulate the content and circulation of cerebrospinal fluid. Spinal nerves are arranged metamerically on either side of the spinal cord. Each spinal nerve is connected to the spinal cord by two roots, dorsal and ventral. The dorsal root is sensory (somatic and visceral) and visceral motor, and has a spinal ganglion. The ventral root is visceral and somatic motor and has no ganglion. The autonomous nervous system consists of sympathetic and parasympathetic ganglions and nerves, and regulates several functions autonomously. Most of the internal organs are innervated by fibres from both systems and the responses produced are often, though not always, antagonistic. This system regulates the heart, gill ventilation movements and peristalsis of the digestive tube, among other functions. The autonomous system is closely related to the brain and spinal cord and connects with muscle, viscera, glands and circulatory system vessels. The sympathetic system ganglia are arranged metamerically on both sides of the spinal cord and connected by sympathetic fibres, while the parasympathetic ganglia are located near the organ they innervate. Pathologies of the nervous system that may be recognized include deformities, atrophy, tumours, granulomas, haemorrhage, congestion, oedema and other anomalies recognised histologically as necrosis, encephalitis or meningitis. The sensory organs receive stimuli from the environment and transmit them to the cerebrospinal system. The organs that are sensitive to internal stimuli are called interoreceptors, while those that are stimulated by changes in the outside environment are called exteroreceptors. 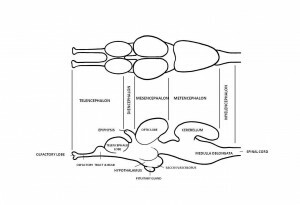 The main exteroreceptors in teleosts are described. Fish have specialized olfactory and taste receptors for capturing chemical stimuli that enable them to find food, locate a mate, defend their territory, group into shoals, recognize migration routes and distinguish environmental features. The olfactory sacs are paired organs located in the anterior dorsal region of the head. They communicate to the outside by means of a pair of double apertures called nares or nostrils (Fig. 3). Water enters through the front nostril and exits through the back. Inside the sacs there is folded olfactory epithelium, formed by four types of cells: receptor, support, mucous and basal cells. The receptor cells are bipolar type sensory neurons (with one axon and one dendrite); some of them have a ciliate distal end and others have a distal end with microvilli. The axons of these olfactory receptor neurons form the olfactory nerve (I) that reaches the olfactory bulb in the telencephalon. Taste buds in fish are short-distance chemical receptors. They are located mainly on the lips, oral cavity and pharynx; although in some fish they may also be on the oesophagus. There can also be taste buds on the integument of the barbels and body, including fins and tail, enabling fish to taste food before swallowing. Taste buds consist of taste cells and support cells. Taste cells have apical microvilli, which are filamentous projections also known as taste hairs. As the taste buds are so widely distributed, stimuli are transmitted by the trigeminal (V), facial (VII), glossopharyngeal (IX) and vagus (X) nerves to the medulla oblongata in the myelencephalon. 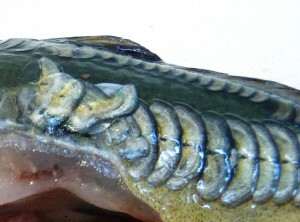 Barbels also have thermal and tactile receptors. The main pathologies of these organ are normally found at the histological level and include congestion, inflammation and necrosis of the olfactory epithelium due to exposure to pollutants, such as heavy metals and petroleum. 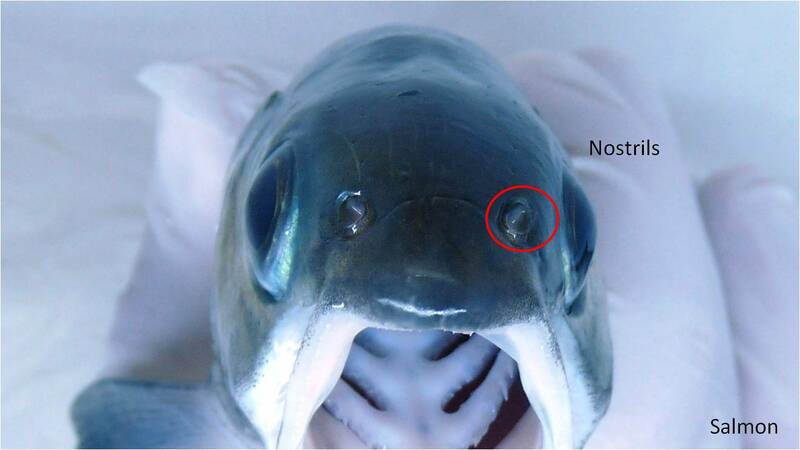 The nostrils may also be affected by certain parasites (protists, monogeneans, copepoda and nematodes). Fish mechanoreceptors are located in the lateral-acoustic system, which comprises the inner ear and the lateral line organ, both of which have the same kind of mechanoreceptor units. They respond to stimuli such as vibrations in the water, angular acceleration and gravity. The inner ear of the fish is related to static and dynamic equilibrium and hearing. It is a paired organ located in the optic capsule of the cranium. It is formed by a closed membranous structure called labyrinth, which contains endolymph and is surrounded by perilymph. Both the perilymph and the endolymph are watery fluids with different ionic compositions. The labyrinth is divided into an upper and a lower part. The upper part is formed by a sac (utricles), and three semi-circular tubular canals arranged on three perpendicular planes (Fig. 4). 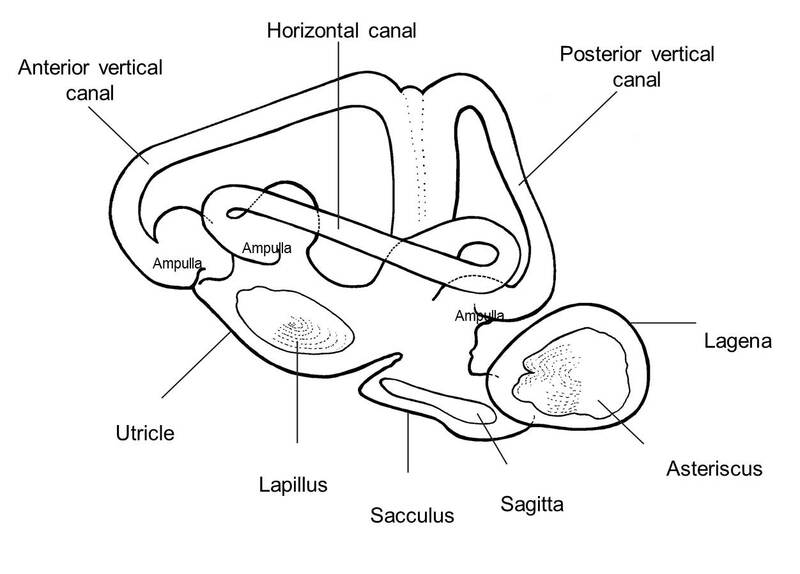 The lower part consists of two sacs (sacculus and lagena). Each of the three sacs contains a calcareous nodule called an otolith, which increases in size throughout the entire lifetime of the fish due to the deposition of salt, mainly calcium carbonate. The three otolithes are lapillus, sagitta, and asteriscus. Sagitta is the largest of all and is often use for age determination (Fig. 5). Each semi-circular canal widens into an ampulla at one end. The sensorial epithelium is concentrated in areas called cristae in the ampullae of the canals, and maculae in the sacs (see Fig. 4). This epithelium is formed of receptor cells (hair cells) with different kinds of apical cilia, and support cells, both covered by a gelatinous cupule. The movement of the endolymph in the canals stimulates the sensory cells and provides information on the movement and turns the fish makes. 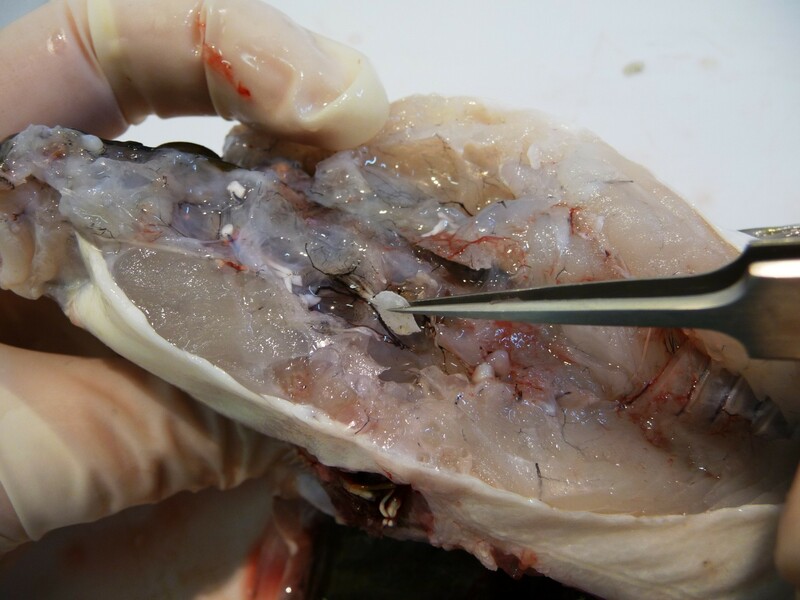 Inside the sacs, the otoliths exert pressure on the maculae, providing information on the position of the body. Impulses originating in the inner ear are transmitted by the acoustic nerve (VIII) to the medulla oblongata of the myelencephalon, and to the mesencephalon and metencephalon. Little is known about the hearing ability of fish. In most fish, sound is transmitted through the cranial bones. Ostariophysi (Cypriniformes, Characiformes, Siluriformes and Gymnotiformes) have the most highly differentiated sound transmission apparatus among the teleosts, the Weberian apparatus, which is paired and formed by modification of the 4 or 5 first vertebrae. It is located between the inner ear and the anterior chamber of the air bladder, which acts as a sound receptor. The sensory cells of the labyrinth are also receptors of sound vibrations. 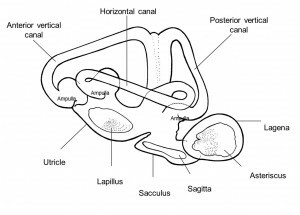 The lateral line is a paired sensory organ involved in the reception of stimuli linked to movements related to prey capture, predator avoidance and swimming in shoals. It includes a set of superficial ducts arranged on the head and flank . Typically ducts on the head are branched meanwhile a single duct spans the length of the flank. These ducts communicate to the outside by means of smaller ducts that open out through pores located at regular intervals. If there are scales, the pores pass through them (Fig. 6). These pores allow the passage of water. The receptor units, called neuromasts, are contained within the canals of the lateral line (canal neuromasts) or may be scattered individually over the integument (free or superficial neuromasts). The canal neuromasts are larger. Each neuromast contains sensory cells (hair cells) with two different types of cilia on their apical surface, as well as mucous cells and support cells. The apical surface of each neuromast projects into a gelatinous substance, the cupula. Changes in water pressure stimulate the neuromasts, which act by reporting on the state of movement or rest of the fish and on the speed at which it moves with respect to the surrounding water, thus enabling it to detect bodies moving towards it and providing what is called touch at a distance. The impulses generated in the canals of the lateral line are transmitted by the facial (VII), acoustic (VIII), glossopharyngeal (IX) and vagus (X) nerves. 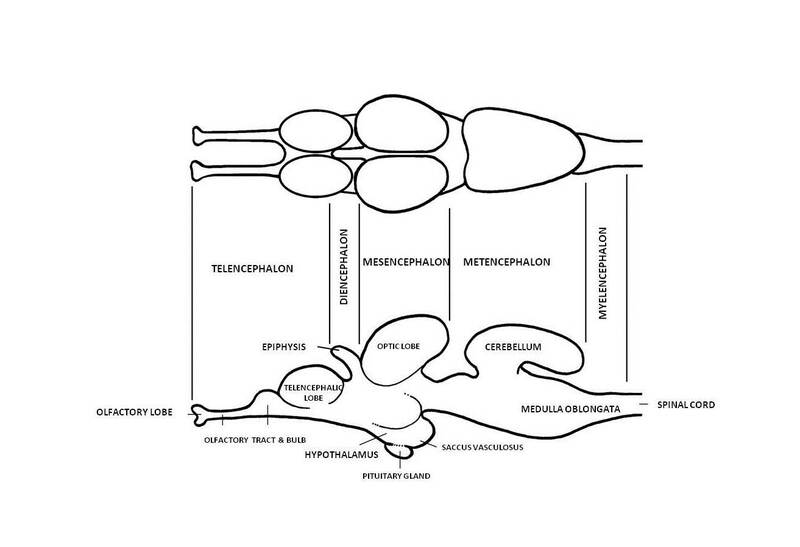 Most fibres coming from the lateral line end in stato-acoustic areas of the medulla oblongata of the myelencephalon and in the metencephalon. Histological anomalies have been reported for the inner ear and lateral line, and ectoparasites have been reported for the lateral line. As in most vertebrates, vision is an important sense in fish. Teleost eyes are highly sensitive to light and there are variations in visual acuity and ability to see colours, depending on the habitat of the species. Colour in many species is used as a mechanism for intra-specific recognition and is enhanced during the breeding season. Vision also takes part in the sense of equilibrium. The eye is a paired, highly specialized organ, located symmetrically on the head within the optic capsule. 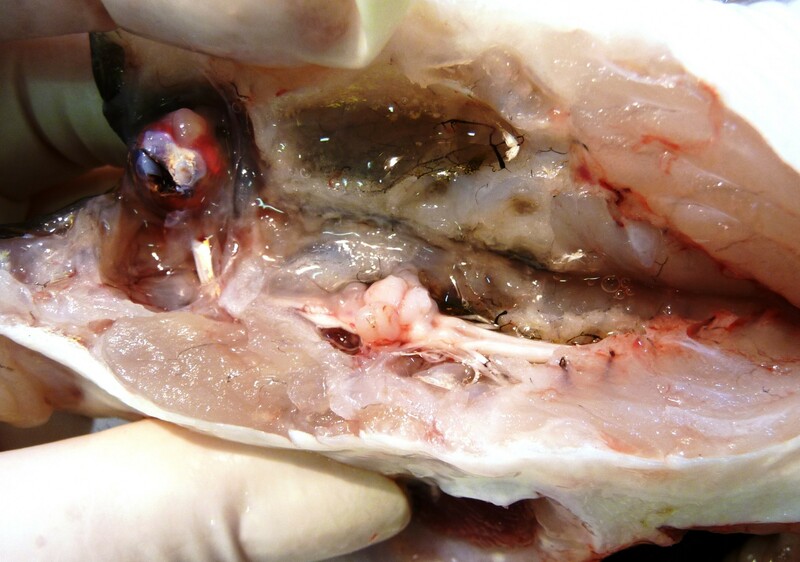 As in all vertebrates, the teleost eye is chambered (with a closed chamber structure). 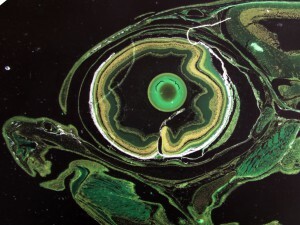 It has the following layers from the outside inward: sclera, choroid and retina (Figs. 7a and 7b). The sclera protects and shapes the eyeball and is supported by cartilaginous or bony elements. It is attached to three pairs of ribbon-shaped oculomotor muscles that move the eye. The front part of the sclera is transparent and constitutes the middle layer of the cornea. The cornea is the anterior part of the eye and also, has two other layers. The choroid is pigmented and highly vascularized. It forms the iris, a circular, not very contractile diaphragm. In the centre of the iris there is a usually circular orifice, the pupil. The outside of the choroid is the argente, a layer that contains cells with guanine crystals and acts as a reflective surface. 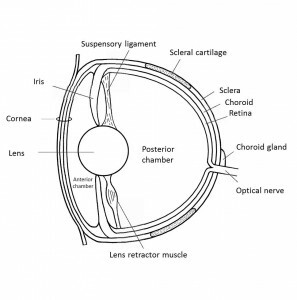 On the inner side of the choroid is the retina, consisting of several layers of cells, of which the outermost is the layer of photoreceptive cells (rods and four types of cones). The innermost layer of the retina contains nervous fibres that form the optic nerve (II), which emerges from the back of the eye. Some of the fibres of the optic nerve go to the mesencephalon and others go to the diencephalon. In the retina there are cells that reflect incident light, doubly stimulating the photoreceptive cells. There is considerable variation in the degree of vascularization in the retina of different teleost species. In fish with pseudobranch, the choroid has a vascular network, which if highly developed is called the choroid gland (see Fig. 7a) , choroid rete or choroid body. 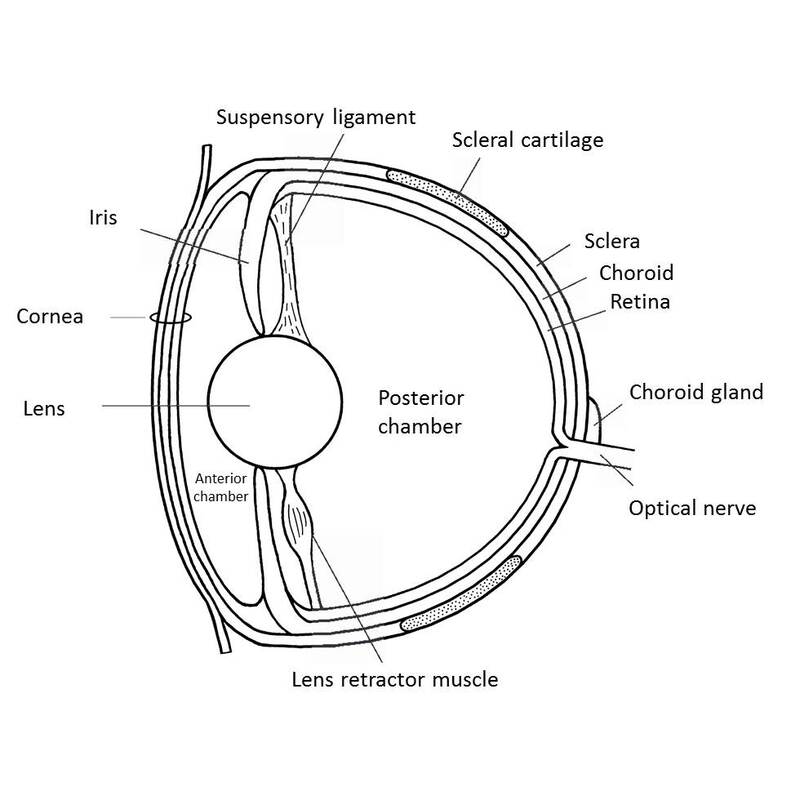 This structure is located at the back of the eye, surrounding the optic nerve. Its main function is elevating the oxygen pressure needed for the retina to function. Even though the choroid rete is sometimes referred to choroid gland, it probably has no gland function. Inside the eye is the lens, a hard, transparent, non-deformable sphere, which divides the ocular chamber into two parts: the anterior chamber, filled with aqueous humour, and the posterior chamber with vitreous humour. The lens protrudes partially through the iris, enabling wide-angled vision. It is kept in place by a dorsal suspensory ligament and a ventral retractor lentis muscle (see Figs. 7a-b). The image is focused on the retina by the lens being moved backward by the retractor lentis muscle, accompanied antagonically by the action of the suspensory ligament. Many pathological changes have been found in the eye. The two most common are cataracts caused by different factors (nutrition, parasites and environment) and exophthalmia due to gas bubbles. Other pathologies are endophthalmia, opacity of the cornea, vitreous humour and lens, eyeball rupture, ulcers, oedema and inflammation of the cornea and retinal detachment. In addition to the paired eyes described above, the epiphysis or pineal gland is not simply a neuro-endocrine organ, but it also has a photosensitive function with cells that are structurally and physiologically similar to the sensory cells of the retina. It is involved in regulating the activities that vary according to the daily or seasonal changes in light cycles. – OSTRANDER, G. K. (2000). The laboratory fish. San Diego, Academic Press. http://www.sciencedirect.com/science/book/9780125296502.